I didn't sleep well last night. My Fitbit said 6 hours. Tossing and turning until 4:45, I decided to get up and work on my column for Sunday. Jilda had some tests today a the "ear-doc." I'll let her tell that tale. After she got up, we drank our coffee and then walked a quick lap before heading into Birmingham. Getting a few steps in, felt good. 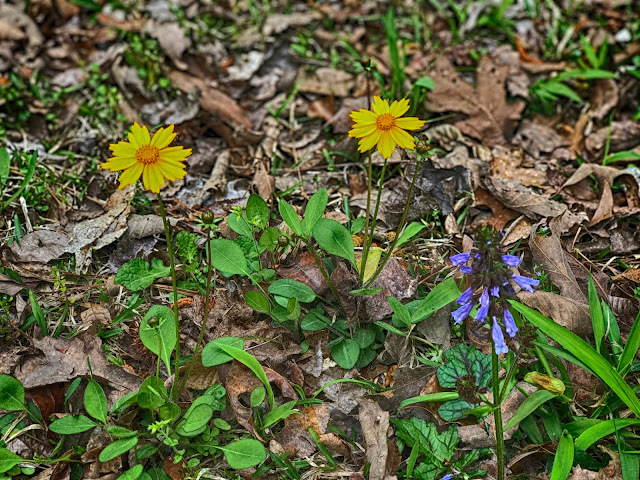 Down close to the barn I noticed a couple daisy and a purple flower I couldn't name. I knew I might need a picture on tonight's blog so I snapped a few. I knew the tests would take a while, so I carried my laptop. The wall screen TV was on full blast. We rarely watch TV at home, and I HATE tvs in waiting rooms. Shoving my headphones knuckle deep into my ears, I put on my focus music and finished up my column. Tonight will be an early night. I hope your Wednesday was a good one. I am playing catch up since I was gone this past weekend. I wish I knew the flowers but I have seen these before on other blogs. I am a sad gal because I wouldn’t know what to do without tv. Here is hoping tonight is better. Love the flower close ups. I'm a little beat here too! I already read Jilda's post. She seems hopeful that there is help for her. It is wonderful news. Flower looks like a Spanish Bluebell to me. Sorry you have sleep problems. I can sympathize. For me, 6 hours would be a fantastic night's sleep. Consider a sleep test if it keeps up. TV? Ugh! I didn't know that fitbit could measure your sleep. Consider me ignorant. I hope you have a better night - and that Jilda gets good news. I had a bad sleep as well because of my injured shoulder. It would be wonderful to have a pain free day and night. I'm not sure how many hours I sleep a night. Maybe a fit-bit could tell me. I wonder how a fit-bit know when you sleep or if you're only laying still. Hope you got a good nights sleep. It makes a difference. Still, it sounds like you had a good day and thanks again for the snapshot of spring. We're finally having a warmer day here so maybe we too will soon have some flowers. I have suffered the same things she is going through. Its been going on 2 years now. I turned down the same testing because I was skeerd. Hope she gets to feeling better and you get some rest. My fitbit is used mostly for the alarms.haha. I try to get in 10k steps a day but rarely do I make it. How I loathe 'those' nights when sleep won't come! While the pups were doing their thing in play-land/poop-land yesterday I noticed we've the same cheerful yellow blooms amid the clover. 'Think that was the first time I've paused to observe the earth around my feet since I was a toddler! 'Headed over to Jilda's right now! I read Jilda's post and I'm praying everything goes well. We have a TV in our work breakroom that is hardly every turned on because everyone is always looking at their phones..except me because I'm usually looking at my Kindle! I generally have no problem getting in my steps and since getting our new dog I'm walking almost double, or at least it feels like that! She's a real skittish, scared pooch and I hope I'm up to this challenge! Never had a dog that didn't like to be touched. Atleast she's not mean!